A little bit of girl-power confidence for those who are starting to notice changes with body odour. Long lasting and great value. Rock Chick is kind and gentle to skin and kind to clothes. Being unfragranced it will work without anyone knowing it is there. Empowering girls to be confidently active and the star of their own show. Suitable for ages 6 and up! Potassium Alum (a natural mineral salt). Wet underarms. Quickly rub on skin whilst skin damp. After use, dry Rock Chick with a towel and store somewhere safe and dry. Keep out of reach of children when not in use and supervise when used by a child. Contains salt and may mark some household substances. Avoid contact with eyes, in case of contact wash with copious amounts of water. In the unlikely event of irritation, discontinue use. Do not apply to broken or damaged skin. 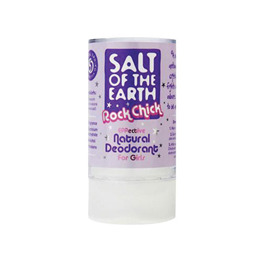 Below are reviews of Salt of the Earth `Rock Chick` Deodorant - Girls - 90g by bodykind customers. If you have tried this product we'd love to hear what you think so please leave a review. Amazing product!!! I honestly didn't expect it to work well. It goes on great, no smell or residue. I'm just gutted that I've been using harmful toxins for all these years. Will be recommending this to everyone. My 7 year old had started to smell of BO and even though I washed her in the evenings, she would still smell by the morning. This has completely changed things as she no longer smells at all and loves using it. 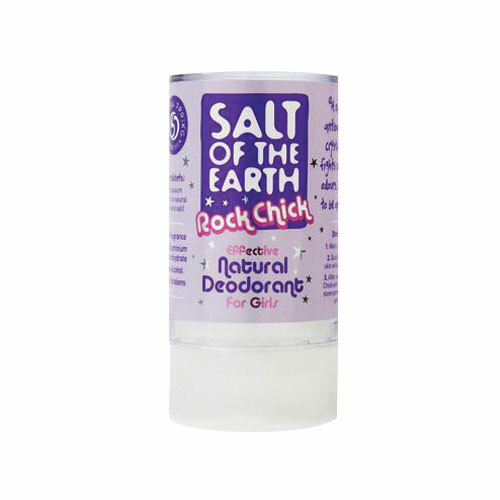 It is no stingy in any way unlike other natural deodorants I had read about and I think it's fantastic!